ji'-ants The word appears in the King James Version as the translation of the Hebrew words nephilim ( Gen 6:4; Num 13:33 ); repha'im ( Deut 2:11,20; 3:11,13; Jos 12:4 , etc. ); rapha' ( 1Chron 20:4,6,8 ), or raphah ( 2Sam 21:16, 18, 20, 22 ); in one instance of gibbor, literally, "mighty one" ( Job 16:14 ). In the first two cases the Revised Version (British and American) changes "giants" into the Hebrew words "Nephilim," nephilim, and "Rephaim," repha'im, respectively. The "Nephilim of Gen 6:4 are not to be confounded with the "mighty men" subsequently described as the offspring of the unlawful marriages, of "the sons of God" and "the daughters of men." It is told that they overspread the earth prior to these unhallowed unions. That the word, whatever its etymology, bears the sense of men of immense stature is evident from the later passages; Num 13:33 . The same is true of the "Rephaim," as shown by the instance of Og ( Deut 3:11; Jos 12:4 ). There is no doubt about the meaning of the word in the ease of the giants mentioned in 2Sam 21 and 1Chron 20 . Anthropologists have found evidence of humanoid giants existing into the far distant past, over 1 million years ago (see Gigantopithecus). Since then it is possible that numerous civilizations, troupes and tribes of human and human-like giants lived and perished across planet earth. Those mentioned in the Bible, Nephilim, Emim and Anakim, may have been a tiny element of a once expansive human giant civilization, especially before the Great Flood of the Bible, and other sources. Giants (1.) Heb. nephilim , meaning "violent" or "causing to fall" (Gen 6:4). These were the violent tyrants of those days, those who fell upon others. The word may also be derived from a root signifying "wonder," and hence "monsters" or "prodigies." In Num 13:33 this name is given to a Canaanitish tribe, a race of large stature, "the sons of Anak." The Revised Version, in these passages, simply transliterates the original, and reads "Nephilim." (2.) Heb. rephaim , a race of giants (Deu 3:11) who lived on the east of Jordan, from whom was descended. They were probably the original inhabitants of the land before the immigration of the Canaanites. They were conquered by Chedorlaomer (Gen 14:5), and their territories were promised as a possession to Abraham (Gen 15:20). The Anakim, Zuzim, and Emim were branches of this stock. In Job 26:5 (R.V., "they that are deceased;" marg., "the shades," the "Rephaim") and Isa 14:9 this Hebrew word is rendered (A.V.) "dead." It means here "the shades," the departed spirits in Sheol. In Sam2 21:16, Sam2 21:18, Sam2 21:20, 33, "the giant" is (A.V.) the rendering of the singular form ha raphah, which may possibly be the name of the father of the four giants referred to here, or of the founder of the Rephaim. The Vulgate here reads "Arapha," whence Milton (in Samson Agonistes) has borrowed the name "Harapha." (See also Ch1 20:5, Ch1 20:6, Ch1 20:8; Deu 2:11, Deu 2:20; Deu 3:13; Jos 15:8, etc., where the word is similarly rendered "giant.") It is rendered "dead" in (A.V.) Psa 88:10; Pro 2:18; Pro 9:18; Pro 21:16 : in all these places the Revised Version marg. has "the shades." (See also Isa 26:14.) (3.) Heb. 'Anakim (Deu 2:10, Deu 2:11, Deu 2:21; Jos 11:21, Jos 11:22; Jos 14:12, Jos 14:15; called "sons of Anak," Num 13:33; "children of Anak," Num 13:22; Jos 15:14), a nomad race of giants descended from Arba (Jos 14:15), the father of Anak, that dwelt in the south of Palestine near Hebron (Gen 23:2; Jos 15:13). They were a Cushite tribe of the same race as the Philistines and the Egyptian shepherd kings. David on several occasions encountered them (Sam2 21:15). From this race sprung Goliath (Sa1 17:4). (4.) Heb. 'emin , a warlike tribe of the ancient Canaanites. They were "great, and many, and tall, as the Anakims" (Gen 14:5; Deu 2:10, Deu 2:11). (5.) Heb. Zamzummim (q.v. ), Deu 2:20 so called by the Amorites. (6.) Heb. gibbor (Job 16:14), a mighty one, i.e., a champion or hero. In its plural form (gibborim) it is rendered "mighty men" (2 Sam. 23:8-39; Kg1 1:8; 1 Chr. 11:9-47; Ch1 29:24.) The band of six hundred whom David gathered around him when he was a fugitive were so designated. They were divided into three divisions of two hundred each, and thirty divisions of twenty each. The captains of the thirty divisions were called "the thirty," the captains of the two hundred "the three," and the captain over the whole was called "chief among the captains" (Sam2 23:8). The sons born of the marriages mentioned in Gen 6:4 are also called by this Hebrew name. Nephilim - According to Micah 3, God used the Nephilim Giants to punish Israel. They are hidden but will soon return during the "Tribulation" to lead the nations against Israel. This will be the taller ones. The "Gold Museum" of Peru has displays of Giant skulls and mummies who were evidently Royalty, according to the clothing and artifacts they had with them. Glenn photographed the mummies of two of these giant men in Lima Peru in 1969. These giants are still in the gold museum in Lima Peru today and can be seen by anyone who visits. They were mummified because their golden robes are prominently on display. Their crowns could fit around Glenn’s waist. Their golden gloves have fingers ten inches long. Their mummies can be measured with a tape and they were both around nine and a half feet tall. There were other personal items fit for a giant king, that wouldn’t have been useful to a man of normal size. The actual bodies are there incased in glass for all to see. The news media has never photographed anyone nine and a half feet tall. These were not mutations. A mutation is something that happens once in a “blue moon”. There were two giants in Peru side by side from successive generations. What makes the story even stranger is that the average height of the Peruvians, both now and historically, is well under six feet high. This isn’t the only time Giants were mentioned by prominent people who visited South America. Don Cieza de Leon and Agustin de Zarate published texts on South American Giants in 1553 AD and 1555 respectively. These books came just after the arrival of the conquistadores and were published within twenty years of Pizarro. They said that the native traditions told the incoming Spanish that the giants came to the Americas on raft-like boats. Some of these men were so tall that from the knee down they were as big as a man. Their eyes were the size of plates. Some were clad in skins and others were mostly naked. They said that there were no women on these boats, which was strange indeed. These giants dug deep wells for water that still exist today through solid rock. Cieza de Leon said that when Don Antonio de Mendoza went to Cuzco Peru in 1560 that he found tombs with extremely large bones, similar to the ones that were already found in Mexico City at the time of Montezuma. Padre Acosta found similar large bones in 1560 in Manta Peru where they later found similar bones in 1928 when constructing the railroad to Ecuador. They were hidden behind stalagmites in caves. These giants were granted a state of quasi-unprotected immortality by deity. They could be killed, but did live long periods of time if they weren’t deliberately killed and for the most part couldn’t bare children. According to Hesiod these “Watchers”, one of the parents of the giants, were men from the four former epochs of human existence prior to the coming of Adam and Eve. Adam wasn’t the first man on the earth. He was the patriarch of the final epoch of time. How else could their have already been men of old and men of renown when Adam and Eve had their first children? That is exactly what it says in Genesis chapter six. The four previous epochs of time rose in culture and science, but were exterminated because they violated the laws of the earth and deity. We are headed for a similar cataclysm in our day because of our rejection of deity. A human remnant of the four epochs survived because of their valiant nature and those people, numbering in the thousands, were called the “Watchers”. Hesiod suggests that this remnant numbered in the thousands. These immortals who survived the cataclysms of the four previous epochs of time were also called angels because they were allowed to pass from the realm of Deity to mortality seamlessly. They were allowed to pass between the heavens and the earth because they were given the assignment by deity to watch over mortals. This is another reason they lived so long and paradoxically the reason they were commanded not to have children. Their job wasn’t to interfere with men unless directly commanded. These Watchers weren’t classic disembodied spirits, as is the case with classic angels. Most of the evidence and history of the Watchers is included in the audio class “Daniel and the Watchers”. In essence the Watchers were noble-immortal men who have yet to die; a status granted them by deity because of their righteousness. Two hundred some odd of these watchers, because they were still in the flesh, found the daughters of Eve attractive and violated their agreements with deity not to intervene in the lives of men. That is why they are often called “Fallen Angels”. They bore children to mortal women which was against their agreement with God. They were angels because of the status deity gave them and fallen because they violated the agreement. However, not all the watchers violated the agreement with deity and remain men of old and men of renown who come and go at the behest of deity. These are the ones who still appear today during a moment in crisis, effect rescues and give important messages and then are gone. Most of us have either had a first hand encounter with one of them at a moment in crisis, or have heard of the stories from our friends. Soon after Maldonado discovered the Seri giants, Captain Melchior Diaz came across another tribe of huge Indians while searching farther up the coast for the ships carrying supplies for Coronado's 1540 expedition. Pedro de Castaneda reported that, “After going about 150 leagues, they came to a province of exceedingly tall and strong men-like giants.” Evidently, these were the Cocopa, a Yuman tribe who also inhabited the lower Rio Colorado, which the Indians called Rio del Tison. Rupert Gould said in his book Enigmas in 1945, included another quote about Magellan’s voyage and added, This man was so tall that our heads scarcely came up to his waist, and his voice was like that of a bull. Twenty years before Magellan came, Amerigo Vespucci and some fellow sailors sighted several giants off the coast of Venezuela. Amerigo, for whom approximately one-third of the world was later named, recounted this experience: “Thus sailing along, we came upon an island [Curasao] which was situated fifteen leagues from the mainland. At our arrival, since we saw no people and the island looked favorable to us, we decided to explore it, and eleven of us landed. We discovered a trail and set ourselves to walk on it two leagues and a half inland; we met with a village of twelve houses in which we did not find anyone except seven women. They were of such great stature that there was not one of them who was not taller than every one of us by a span and a half [about 19 inches]. When they saw us they were very much afraid of us. The chief one of them, who was certainly a discreet woman, by signs hauled us up to a house and made them give us refreshments. When we saw such noble women, we determined to carry off two of them, who were young women fifteen years of age, and make a present of them to the king. They were creatures whose stature was certainly above that of average men. While we were thus plotting, thirty-six men arrived, who entered the house where we were drinking, and they were of such lofty stature that each of them was taller when upon his knees than I was when standing erect. They were of the stature of giants in their great size and in the proportion of their bodies, which corresponded with their height. Critics have long suggested that the stories from South America are just too incredible to be true. They have openly asked why there aren’t stories of giants in the North America. Nothing could be farther from the truth. Again we are people who run from subjects that don’t neatly conform to what we believe. And it came to pass, when men began to multiply on the face of the earth, and daughters were born unto them, That the sons of God saw the daughters of men that they were fair; and they took them wives of all which they chose. And the Lord said, My spirit shall not always strive with man, for that he also is flesh: yet his days shall be an hundred and twenty years. The phrase 'and also afterwards' is a later addition in an attempt to harmonize the Genesis account with the book of Numbers and Samuel, for reasons which will become obvious. These giants appear to be an ancient Hebrew equivalent to the Greek myth of Hercules or Cyclops. Shortly thereafter everyone on earth, including all the giants, called Nephilim, perish in the flood, with the exception of Noah and his family. The Anakim lived in the south, near Hebron. They were defeated by the Israelites under Joshua. 6 The LORD said to Joshua, "Do not be afraid of them, because by this time tomorrow I will hand all of them over to Israel, slain. You are to hamstring their horses and burn their chariots." 10 At that time Joshua turned back and captured Hazor and put its king to the sword. (Hazor had been the head of all these kingdoms.) 11 Everyone in it they put to the sword. They totally destroyed  them, not sparing anything that breathed, and he burned up Hazor itself. Joshua.12:4 "And the coast of Og king of Bashan, which was of the remnant of the giants." 2 Sihon king of the Amorites, who reigned in Heshbon. He ruled from Aroer on the rim of the Arnon Gorge-from the middle of the gorge-to the Jabbok River, which is the border of the Ammonites. This included half of Gilead. 3 He also ruled over the eastern Arabah from the Sea of Kinnereth  to the Sea of the Arabah (the Salt Sea  ), to Beth Jeshimoth, and then southward below the slopes of Pisgah. 4 And the territory of Og king of Bashan, one of the last of the Rephaites, who reigned in Ashtaroth and Edrei. 5 He ruled over Mount Hermon, Salecah, all of Bashan to the border of the people of Geshur and Maacah, and half of Gilead to the border of Sihon king of Heshbon. 6 Moses, the servant of the LORD , and the Israelites conquered them. And Moses the servant of the LORD gave their land to the Reubenites, the Gadites and the half-tribe of Manasseh to be their possession. Og the king of Bashan had reigned in Ashtaroth and Edrei and had survived as one of the last of the Rephaites. Moses had defeated them and taken over their land. 13 But the Israelites did not drive out the people of Geshur and Maacah, so they continue to live among the Israelites to this day. Then it ran up the Valley of Ben Hinnom along the southern slope of the Jebusite city (that is, Jerusalem). From there it climbed to the top of the hill west of the Hinnom Valley at the northern end of the Valley of Rephaim. 9 From the hilltop the boundary headed toward the spring of the waters of Nephtoah, came out at the towns of Mount Ephron and went down toward Baalah (that is, Kiriath Jearim). (Said to Joseph) 15 "If you are so numerous," Joshua answered, "and if the hill country of Ephraim is too small for you, go up into the forest and clear land for yourselves there in the land of the Perizzites and Rephaites." Jos.18:16 "The valley of the son of Hinnom, and which is in the valley of the giants." 16 The boundary went down to the foot of the hill facing the Valley of Ben Hinnom, north of the Valley of Rephaim. It continued down the Hinnom Valley along the southern slope of the Jebusite city and so to En Rogel. as when a man gleans heads of grain in the Valley of Rephaim. David & Goliath: 1 Sam.17:4 "Goliath, of Gath, whose height was six cubits and a span....."
4 A champion named Goliath, who was from Gath, came out of the Philistine camp. He was over nine feet  tall. 5 He had a bronze helmet on his head and wore a coat of scale armor of bronze weighing five thousand shekels  ; 6 on his legs he wore bronze greaves, and a bronze javelin was slung on his back. 7 His spear shaft was like a weaver's rod, and its iron point weighed six hundred shekels. His shield bearer went ahead of him. The biblical giant Goliath of Gath (or "the Gittite"), whom the teenage David killed with a sling stone (I Samuel 17). Goliath's brother and sons were also men of great stature, and the Bible explicitly mentions that David and his men killed them all (II Samuel 21:15-22; I Chronicles 20:4-8). 18 Now the Philistines had come and spread out in the Valley of Rephaim; 19 so David inquired of the LORD , "Shall I go and attack the Philistines? Will you hand them over to me?" The LORD answered him, "Go, for I will surely hand the Philistines over to you." 20 So David went to Baal Perazim, and there he defeated them. He said, "As waters break out, the LORD has broken out against my enemies before me." So that place was called Baal Perazim. 21 The Philistines abandoned their idols there, and David and his men carried them off. 22 Once more the Philistines came up and spread out in the Valley of Rephaim; 23 so David inquired of the LORD , and he answered, "Do not go straight up, but circle around behind them and attack them in front of the balsam trees. 24 As soon as you hear the sound of marching in the tops of the balsam trees, move quickly, because that will mean the LORD has gone out in front of you to strike the Philistine army." 25 So David did as the LORD commanded him, and he struck down the Philistines all the way from Gibeon  to Gezer. The Rephaim occupied the land prior to the Canaanites, but were eventually defeated. The Anakim, Zuzim, and Emim people were related. Dt.2:10-11 "The Emims dwelt therein in times past, a people great, and many, and tall, as the Anakims; Which also were accounted giants." Dt.2:20-21 "That also was accounted a land of giants: giants dwelt therein in old time.... A people great, and many, and tall, as the Anakims; but the LORD destroyed them." 1 Chr.11:23 "And he slew an Egyptian, a man of great stature, five cubits high." 22 Benaiah son of Jehoiada was a valiant fighter from Kabzeel, who performed great exploits. He struck down two of Moab's best men. He also went down into a pit on a snowy day and killed a lion. 23 And he struck down an Egyptian who was seven and a half feet  tall. Although the Egyptian had a spear like a weaver's rod in his hand, Benaiah went against him with a club. He snatched the spear from the Egyptian's hand and killed him with his own spear. 4 And it came to pass after this, that there arose war at Gezer with the Philistines; at which time Sibbechai the Hushathite slew Sippai, that was of the children of the giant: and they were subdued. 5 And there was war again with the Philistines; and Elhanan the son of Jair slew Lahmi the brother of Goliath the Gittite, whose spear staff was like a weaver's beam. 6 And yet again there was war at Gath, where was a man of great stature, whose fingers and toes were four and twenty, six on each hand, and six on each foot: and he also was the son of the giant. 7 But when he defied Israel, Jonathan the son of Shimea David's brother slew him. 8 These were born unto the giant in Gath; and they fell by the hand of David, and by the hand of his servants. Giants are humanoid creatures of prodigious size and strength, a type of legendary monster that appear in the tales of many different races and cultures. They are often stupid or violent and are frequently said to eat humans, especially children; others, however, like Oscar Wilde's giants, are intelligent and friendly. The Cyclopes of Homer's Odyssey were giants, as was Goliath who strove with King David in the Bible. The Bible also records a race of giants called "Nephilim". Genesis states that "There were giants in the earth in those days; and also after that, when the sons of God came in unto the daughters of men and they bore children to them, the same became mighty men who were of old, men of renown." (Gen. 6:4 KJV); here "giants" is a translation of the Hebrew "Nephilim". Post-biblical tradition holds that Nimrod was a member of this race. In Germanic mythologies (see Norse mythology), giants (Jotuns) are often opposed to the gods. In particular, the Wodin/Odin-derived mythologies of Northern Europe feature frost giants, who are eternally opposed to the Aesir. The Aesir themselves emerged from the race of giants, and in the eventual, apocalyptic battle of Ragnarok the frost giants will storm Asgard, home of the gods, and defeat the gods in war, bringing about the end of the world. In the mature form of this mythology recorded in the Edda poetry and prose, giants inter-marry with the gods and are the origin of most of the monsters in Nordic mythology (e.g., the Fenris Wolf), so relations between the Aesir and the giants are sometimes cordial and sometimes adversarial. Tales of combat with giants were a common feature in the folklore of Wales and Ireland. From here, giants got into Breton and Arthurian romances, and from this source they spread into the heroic tales of Torquato Tasso, Ludovico Ariosto, and their follower Edmund Spenser. The giant Despair appears in John Bunyan's Pilgrim's Progress. Norse and Anglo-Saxon mythology are also rich in tales of giants, which seem there to be a separate race akin to the gods, and strove often with Thor. Ogres and trolls are giant-like humanoid creatures that occur in various sorts of European folklore. In Basque mythology, giants appear as jentilak (Gentiles) and mairuak (Moors). They are who made dolmens and menhirs. After Christianization, the giants were driven away. The only remaining one is Olentzero, a coalmaker that brings gifts on Christmas Eve. Giants figure in a great many fairy tales and folklore stories, such as Jack and the Beanstalk and Paul Bunyan. It is possible that tales of giants derive from the remains of previous civilizations. Saxo Grammaticus, for example, argues that giants had to exist, because nothing else would explain the large walls, stone monuments, and statues that we know were the remains of Roman construction. Similarly, the Anglo-Saxon "Seafarer" speaks of the high stone walls that were the work of giants. Giants provided the least complicated explanation for such artifacts. Cyclopes may be originated in antique elephant skulls found in Sicily. If one does not know what an elephant looks like, the place where the trunk is placed on the skull can be mistaken for a giant eyesocket. "Giant" is also colloquially used for a human who is unusually tall, or afflicted with one of the several forms of gigantism. Gigantes y cabezudos ("Giants and big-heads") are figures from street processions at Spanish fiestas. Gigantopithecus and Meganthropus are names given to giant hominids found by paleontologists, but since they don't fit too well in the imaginary evolutionary chain, they don't get much attention. Meganthropus is the giant Java man who inhabited Southeast Asia over a million years ago. He stood12 feet tall and weighed several hundred pounds. Java man was found with stone implements consisting of hand axes, clubs, pounders, adzes, knives, and other tools often ranging in weight from 8 to 36 lbs or more. Artifacts, identical to those used by Meganthropus, have been found in Australia. Gigantopithecus is often suspected of being the elusive Bigfoot or Yeti. There are a number of skeletons, skulls, and footprints of giants as tall as 30 feet. They appear in almost every culture's folklore and legend, most of them the "big bully" variety, and a hero dispatches almost all. Theories about the builders of pyramids, stone circles, and other monolithic examples of ancient construction find giants as a possible answer. Big blocks mean big builders. Icon of St. Chistopher (249-251). Church of St. George Cegelkoy. Tradition relates that the saint came from a country of cannibals and that his face was disfigured. When he became a Christian, he was martyred for his faith. Jacques de Voragine, in The Golden Legend, wrote of St. Christopher: "He was of gigantic stature, had a terrifying mien, was twelve coudees tall.” A coudee is equal to or larger than the English foot. According to this ancient account, St. Christopher stood from 12 to 18 feet tall, a fact that was erased from church history. St. Christopher was a member of the north African tribe of the Marmaritae. He was captured by Roman forces during the emperor Diocletian's campaign against the Marmaritae in late 301/early 302 and was transported for service in a Roman garrison in or near Antioch in Syria. He was baptised by the refugee bishop Peter of Alexandria and was martyred on 9 July 308. Bishop Peter arranged for the transport of his remains back to Marmarica in 311. 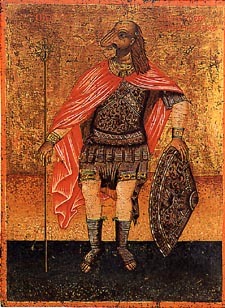 He is really identifiable with the Egyptian martyr known as St. Menas. In so far as the author of the lost, original acts of St. Christopher seems both to have been based at Antioch and to have wanted to encourage missionary activity, he is probably identifiable if not as bishop Theophilus the Indian himself, present at Antioch c.351-54, then as one of his circle. The Greek tradition came to interpret this passage absolutely literally, and this is why Byzantine icons often depicted St. Christopher with a dog's head. In time, of course, this led to a reaction against St. Christopher. The Latin tradition developed along different lines, however, since early Latin translations did not always render a literal translation of the original Greek term "dog-headed" (kunokephalos), and some seem to have translated it as "dog-like" (canineus). This was amended to read "Canaanite" (Cananeus) as time progressed since it was obvious that he could not really have been "dog-like".7 It is important at this point to emphasize that the description of Christopher as from the land of the dog-headed has absolutely nothing to do with the Egyptian cult of the jackal-headed god Anubis.8 The real explanation is rather more prosaic. In brief, the civilised inhabitants of the Greco-Roman world had long been accustomed to describe those who lived on the edge of their world and beyond as the strange inhabitants of stranger lands, cannibals, dog-headed peoples and worse.9 So when the author of the original account of the martyrdom of St. Christopher described his origin from the land of cannibals and dog-headed peoples he was merely signifying that he came from the edge of the civilised world as the inhabitants of the Roman empire saw it, and the Marmaritae did indeed inhabit such a peripheral region.10 He was not to realize that later generations would misinterpret this common cultural metaphor in an entirely literal fashion. 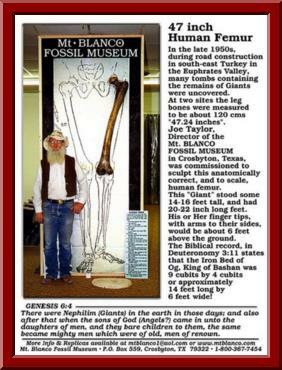 GIANTS IN RELIGION: Evidence for human giants in the Bible and other holy writ.